CASTLEFORD TIGERS play-maker Liam Finn has dedicated their best win of the season so far to coach Daryl Powell. Finn, plucked from Kingstone Press Championship side Featherstone Rovers before the start of last season, dropped more disappointment on fading Leeds Rhinos with a crucial one-pointer in Tigers’ 31-24 success at Headingley Carnegie two days ago. It was the first time Tigers boss Daryl Powell had coached a team to victory over Leeds since leaving Rhinos 12 years ago. Finn described it as a “big win” and he said: “It’s a big part of Daryl’s career, Leeds Rhinos – from playing and going into coaching – and he was probably a little bit unfortunate with his time at Leeds. “He should take a little bit of credit for the team that’s gone on for the next decade and won so many trophies, as I think he brought a lot of them through. Tigers have climbed to fourth in First Utility Super League, but Finn conceded they have only been at their best this year “sporadically”. The last three games have all seen them build a big early lead, allow the opposition back into the match before half-time and then finish strongly. Finn is aware Cas will have to be more ruthless at home to St Helens next Thursday, but he feels the determination they are showing stands them in good stead. “We’ve been inconsistent all season,” he said. “This is the first time we’ve put three wins together and that’s good for our confidence. “We’ve shown a little bit of steel over the last three weeks when we’ve been in tight games, which we didn’t earlier in the season. “Over the last few weeks we’ve spoken about hanging in, waiting for the game to turn a little, waiting for our opportunities and not giving scores away cheaply. Hopefully we’ve given ourselves something to build on. 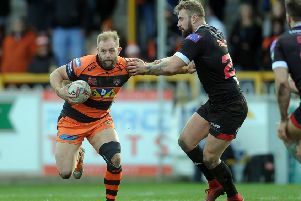 Finn played a key role in the result two days ago, stretching over for Tigers’ second try and then dropping the goal which edged them ahead moments after Leeds had brought the scores level. His half-back partner Luke Gale is Tigers’ first-choice goal kicker, but Finn was a noted marksman during his time at Featherstone, though not normally with his left foot. Explaining the lead-up to his kick, he said: “I wanted to go for it straight off the ruck, but Scotty (Moore, Tigers’ acting-half) didn’t hear me, misunderstood and went the other way. Meanwhile, Tigers have signed French forward Gadwin Springer from Catalans Dragons. Springer has signed a two-and-a-half-year deal, starting immediately. The 22-year-old former Toulouse player will arrive in this country on Monday. He has made three substitute appearances for Catalans this year.